A framed StoryPeople print with this quote should hang on the wall in my kitchen. I mean, the print is there in my kitchen, but sits unframed on the counter leaning on the wall still wrapped in the plastic protective sleeve in which I brought it home from Don Drumm studios in Akron almost five years ago. Some day perhaps I’ll frame it. If I spent less time cooking and pie-making and more time working through my to-do list, I’d probably have framed and hung the print by now, but then it wouldn’t really be the right print for me, would it? People are often curious about the amount of time I spend in the kitchen. A mother of school-aged children must balance a time-consuming leadership gig with food delivery and convenience foods, right? Trust me, I lean on these crutches. You will always find chicken gyoza from Trader Joe’s along with some pizza-like product in the freezer for quick meals for the kids. They can order without menus at several restaurants in our neighborhood. And there are a number of other ways I’m fortunate enough to have the support to find balance. But it brings me great joy to be in the kitchen making food for the people I love and to feed people delicious foods made at my hands. So, when I have the time and occasion to spend a few hours or the bulk of the day in the kitchen I sometimes maybe go a wee bit overboard and lose site of what is reasonable. Like for instance Thursday. Thursday the girls came home after three weeks at sleepover summer camp. This was by far the longest time they’ve spent away and it was stressful for me. (For their part, they had a fabulous time, grew palpably, and cannot wait to go back next year. I’m hoping that I’ll better settle into the peace and quiet next summer with the knowledge of this wonderful experience.) So of course I planned to welcome them home in the best way that I know how—with food and family. The Thursday night plan was to enjoy a quiet family dinner as we typically do and allow the girls to transition back into life at home. In letters to and from camp, I asked and they each shared their welcome-home meal choices: tacos and grilled chicken salad. Aside from making two proteins, the meal is manageable since both involve cutting fresh veggies for the build-your-own buffet. Yum! I had to make both pies Thursday to pull this off and show up for work Friday, but otherwise the menu would be a cinch. I bit off more than I could comfortably chew in my admittedly typical approach to pie-making, however. Firstly, I needed three pie crusts for this dinner (one for the tomato pie and two for the peach lattice pie), but I made four because…well…(thought bubble: I can make 2 at a time in my food processor and why make 3 when you can make 4 with the same effort, and pie is meant to be shared so might as well make an extra to share, and it just so happens that our friends are coming home from Europe the same day that the girls come home from camp, so they would be thrilled to come home to a lovely and comforting tomato pie, and I have plenty of tomatoes and herbs in the garden so I’ll just make two tomato pies and one peach pie, no biggie.) Furthermore, while I had never before peeled the tomatoes for this recipe and the result has always been scrumptious, I figured if I had water boiling to peel peaches anyway (another step I could have skipped and have done so with great results in the past, but didn’t occur to me in all of my excitement over SO MUCH FAMILY FEASTING) I might as well peel the tomatoes too. I have failed to mention this entire day was punctuated with trips to the laundry room to complete the six or so loads of ripe laundry that two kids bring home from three weeks at camp. Before long it was 6:42. 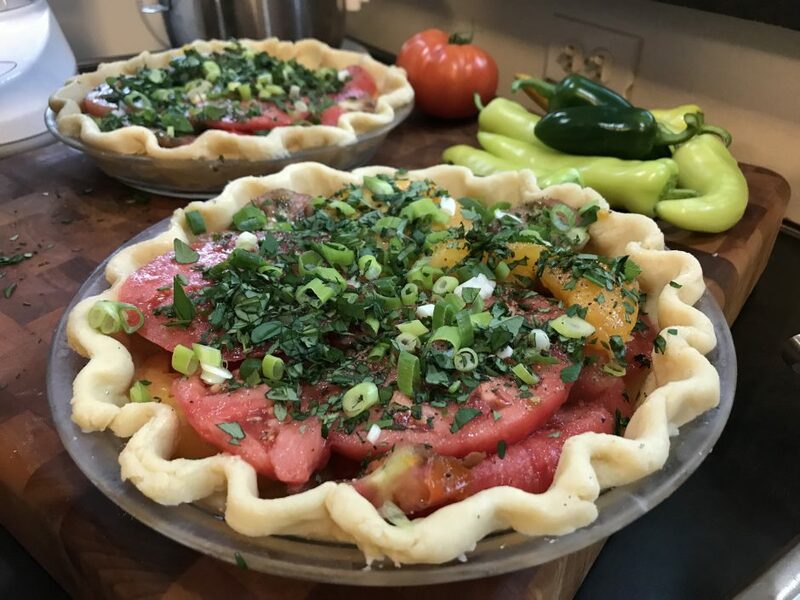 The house smelled incredible from the two gorgeous tomato pies cooling on the table and I was weaving lattice on the peach pie that was about to go into the oven; but other than marinating the chicken and thawing the ground turkey, I’d done nothing to prepare that night’s double entree dinner. I called in reinforcements in the form of my sous chef sweetie. I was feeling unnecessarily harried at this point, and per usual had only myself to blame for it. It was all fine, of course. We had dinner on the table by 7:30 and heard story after delightful story about camp. The twelve year old not only cheerfully answered questions in complete sentences and used vocabulary we’d never heard from her, but she followed up those answers with related stories and details. The shared experience of camp also seemed to bring the girls closer. One daughter’s story sparked the other’s. They would burst into joyful songs we didn’t recognize. They weren’t bickering. Oh, and everyone was eating the food that we had prepared and they said it was good. This tomato pie is not my creation. A coworker shared a copy of a well-used recipe card with me several years ago and I’ve been playing around with variations ever since. It is a versatile and forgiving recipe. Change up the herbs and cheese to play around with the flavors. Peel the tomatoes, or don’t. It makes a lovely side dish for a dinner party, potluck or brunch, or serve it with a green salad for a simple summer supper. Roll out the pie dough and fit into a 9” pie plate. Fold and crimp the edges. Refrigerate for 20 minutes. 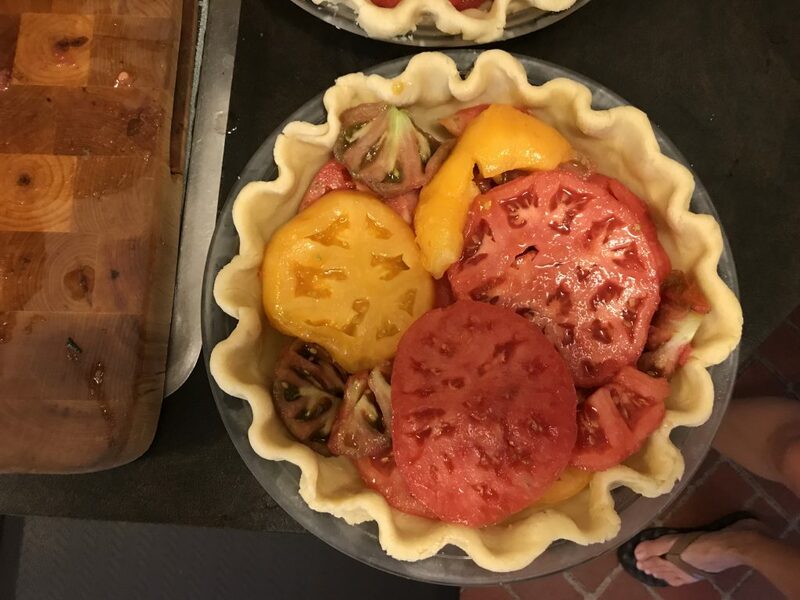 Cover the bottom of the pie shell with thick slices of tomatoes. Season with salt and pepper. Top with remaining tomato slices and season again. Sprinkle scallions and chopped herbs over the tomatoes. Combine shredded cheddar and mayonnaise in a medium bowl. Spread over the tomatoes and herbs. Bake at 425 degrees for 20 minutes. Reduce heat to 325 degrees and back for 20-30 minutes more until the crust and topping are golden brown. 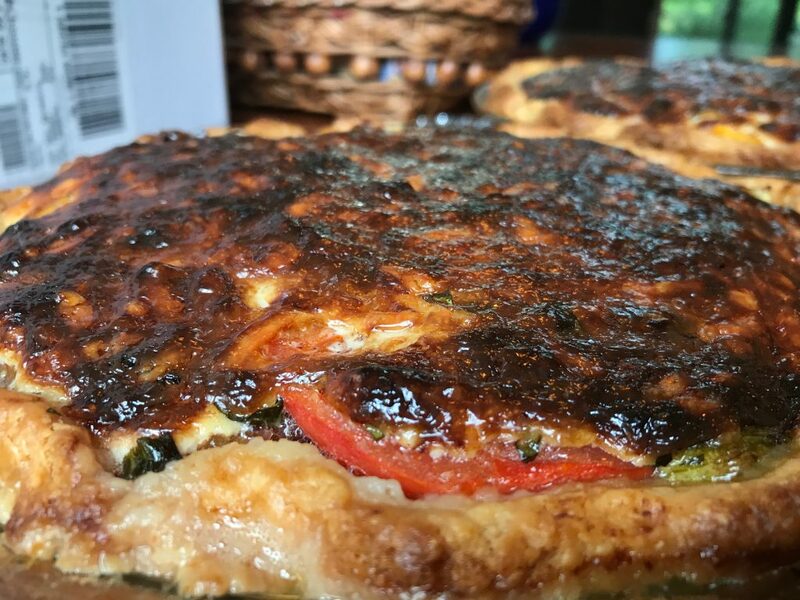 5 thoughts on "Savory Tomato Pie"
This sounds amazing and I can’t wait to give it a shot. I’d love to reduce the mayo a bit. Any suggestions? Thx for sharing…perfect summer recipe. Hi, Monica! Thank you! You absolutely can. The mayo/cheddar combination gives this dish an old-timey comfort that I love, but it’s certainly rich and indulgent. You can cut the mayo (and cheese too if you like) in half and it is still be delicious. Just drop spoonfuls of the mixture around the top of the tomatoes and herbs…they don’t have to be covered. I’ve also used other cheese combinations without any mayo at all (think ricotta/provolone/Parmesan maybe with a beaten egg mixed in). You could also bake it with olive oil and fresh mozzarella and then add some reserved basil chiffonade after it comes out of the oven. It won’t need as much time in the oven though, so keep an eye on it. Please come back and let us know what you decide to do and how it turns out. I cut the mayo down by half and added in an egg. I also added a smidgen of Dijon mustard into the mix which was barely discernible but felt like some extra flavor. It was out of this world and I’m already looking forward to leftovers for lunch tomorrow. This is officially my new favorite summer recipe. Thx for sharing it with us. Yum!